It is best for a chinchilla to have purified water rather than tap water. Tap water can carry bacteria, chlorine, and protozoa that don’t harm humans in small amounts but are deadly and/or harmful to chinchillas. Distilled water is also not a good choice. Distilled water deprives your chinchilla of essential minerals found in water and can cause multiple deficiencies. Check your local area for tap water rules, some cities have such high standards for their tap water that it does not need filtered. If you are on a well, giardia is a common contaminate during the rainy season and it’s good to invest in bottled water or a strong filtration system. The best rule to go by when getting water for your chins is the “if you wouldn’t drink it they shouldn’t have to” rule. The chinchillas are part of the rodent family so their teeth are constantly growing. Like any other rodent chinchillas need wood to keep their incisors down. Acceptable woods are Maple, pecan, pear, apple, pine, willow, elm, choya, cottonwood, mulberry, manzanita, and most other woods proven safe for birds. CEDAR IS TOXIC!! Other unsafe woods include peach and other similar trees where the fruit produced has a “pit” seed and also wood from citrus trees. I highly recommend AZchins.com, My Critter Store (facebook), Tiffanyschinchillas.com, and Sunshinechinchillas.com for supply and toy needs. Chinchillas should be given wood to chew. Plastic items shouldn’t be provided for chewing, replacing them with wooden items encourages your chinchilla to grind its teeth down in a healthy manner. Plastic shelving can be taken out and replaced with pine to provide the chinchilla a ledge to jump on that doubles as a chewing item. PVC pipes are safe for chinchillas to play in and chew on. The pipe is too thick for them to really chew off a big piece to swallow and cause impaction. Many breeders and pet owners have used PVC with chinchillas for more than 40 years with zero impactions. Fleece is a chinchilla approved material and many chinchillas enjoy hanging in hammocks. They can also be given fleece buddies or stuffed animals made from and stuffed with fleece. If a stuffed animal is given to a chinchilla it should have no beads and no eyes. Other materials can also be safe for chinchillas, but it's necessary to ensure there are no obvious seams or thin straps. The chinchilla has no natural parasites because their fur is typically too thick to provide proper housing and nourishment. Thin, sickly chinchillas can house ectoparasites due to thinning fur and overall lowered immune system. While other fur producing animals have a single hair growing from each follicle, Chinchillas have over 50 hairs per follicle, some cases have been recorded of 120 hairs in a single follicle. Its fur is endowed with resilience and resists breakage (a common problem with other furs): a curious combination of soft and delicate, yet strong and durable. They keep their fur clean by taking a dust bath as soon as it is placed in their cage. Of all fur-bearing animals, this little animal does not emit any odor. Also because of the density of their fur they absorb heat quickly. So when outside they absorb heat from sunlight (even when it is overcast they can absorb the heat from the sunlight) very fast and the chances of overheating increase. A suitable sized cage for a chinchilla should be no smaller than 24"x24"x24" and should have no ramps or wire ledges. A chinchilla can jump VERY high so ramps only create an obstacle for a chin to run into and a chinchillas foot can get caught in a wire ledge and break. The cage can be made from 1"x1/2" wire which will prevent injuries in chinchillas of all ages or it can be made out of wood. Make certain to rinse the cage with a solution of water and vinegar to remove any packing or galvanized dust before placing your chinchilla into its new home. As for a suitable litter, pine is the most accepted and safest. However, Aspen and carefresh are suitable substitutes but do not absorb as well. Again we remind everyone that CEDAR IS TOXIC. Your chinchilla should never be housed outside and left to brave the elements. Your chinchilla’s cage will get dirty. This will become a mix of hay, urine, dust, poop, treats, dirty toys, etc. Their stomachs and hindquarters will become dirty and they start to feel bad from being so dirty. Chinchillas are clean animals so it follows that they love being clean. The chinchilla’s health will also become an issue when faced with so much filth just as it would for a human. Chinchillas live longer when they are provided with the proper care which includes CAGE CLEANING. Your house will smell better, the chin won’t have a urine like odor, and the chinchilla will actually feel comfortable. The main problems with not cleaning your cage are ammonia and rot. Ammonia is a harmful chemical. A certain amount of ammonia can kill a human just by being inhaled. So you can just imagine what a small amount would do to such a small animal’s lungs. When shavings become wet they start to rot. Rotting shavings/wood give off ammonia which causes severe respiratory problems in chinchillas. Even if you have a lot of ventilation your chinchilla is RIGHT ABOVE THE ROTTING SHAVINGS. Of course anything that rots becomes a breeding ground for bacteria. The ammonia that the chinchilla breathes in makes it more susceptible to the bacterias breeding in their dirty cage. This is all easily prevented. How you ask? Simple, you CLEAN THE CAGE. All that needs done to keep your chinchilla feeling, looking, and smelling good is that you change the shavings at least once or twice a week. You also need to clean their food dishes and change out wood toys because let’s face it your chinchilla always finds some remarkable way to pee or poop in the food and water. Every 1 to 3 months you should scrub down the cage with bleach, rinse it, and let it dry in the sun. There should be no excuse not to clean one litter pan once a week. Chinchillas originate in the Andes Mountains where it is cool. The room your chinchilla is housed in should NEVER get above 75 degrees. Between 75-80 degrees chinchillas begin to get uncomfortable and lay very still to try to lose heat. Anything above 80 degrees and chinchillas will suffer heatstroke and die in a short period of time. It is extremely important that a chinchilla that is overheating (rolling on its back, pawing at the air, and gasping for breath) is not cooled down too quickly. There isn’t much that can be done other than placing the chinchilla in a cooler room with cool items in its cage to let it slowly cool down. If the chinchilla is not allowed to cool down slowly it will go into shock and die. If you live in an area where temperatures reach above 80 degrees, an air conditioner is a necessary item. 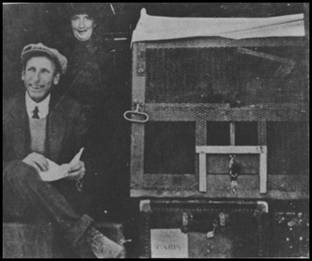 M. F. Chapman and Pete. 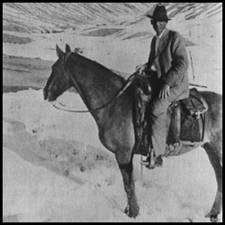 Pete often rode on Mr. Chapman’s shoulder as he tended to the rest of the herd. Those of us who own and love pet chinchillas have Mr. M. F. Chapman to thank for our enjoyment of these gentle animals. 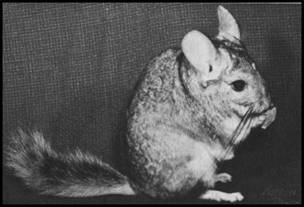 Nearly every pet chinchilla alive today is a descendant of Mr. Chapman's original herd. This is the story of the man who domesticated the chinchilla. The chinchilla was not known outside of its natural range in the South American Andes until the 1500's when the Spanish conquered the Chinca Indians. Chinchilla furs were shipped to Europe as gifts to royalty. Chinchilla fur gained popularity in Europe during the 1700's and, by the 1800s, trappers were managing to decimate the wild chinchilla colonies that remained. In 1899, the "Chinchilla King" Richard Glick, of Leipzig, Germany, handled 78,500 pelts, and more than 300,000 pelts in 1900 and 1901. It is estimated that over a million chinchillas were trapped and their pelts shipped to Europe during this time. Finally, with the chinchilla nearly extinct, the South American governments passed laws outlawing the trapping and killing of chinchillas. There were several different "types" of chinchillas in the Andes. The smaller Costina type was found at lower elevations and the larger Lanigera type was found in the higher altitudes. 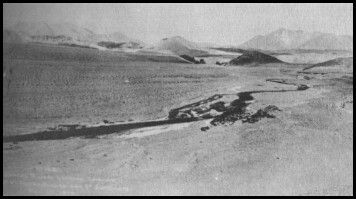 M. F. Chapman’s home at Potrerillos, Chile, was at an elevation of 10,400 feet which is estimated to be about the demarcation elevation of the smaller Costina and the larger Lanigera types. Since most all of the lowland chinchillas had already been trapped out by the time Chapman began his collection, it is thought that most of his animals were of the Lanigera type. 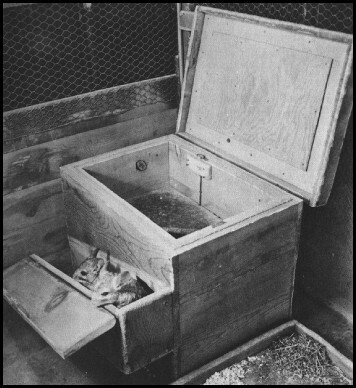 This is one of the Lanigera type chinchillas captured by M. F. Chapman. The search for chinchillas was not an easy one. When his 23 trappers brought in fewer chinchillas than expected, Chapman stepped up his plans and many field trips were taken. Living conditions were primative. Supplies had to be transported long distances. 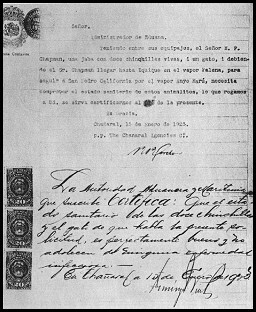 The search which took from 1919 to 1922, covered immense areas including trips into Peru. One trapper who captured a chinchilla reported that it had taken four weeks to return from where the chinchilla was captured. The chinchilla was carried by donkey in a container made of a five gallon oil can. It had been fed, but had been given no water since the Indians believed that chinchillas did not drink and would die if given water. 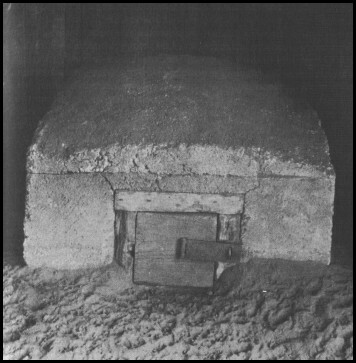 It is believed that this chinchilla was trapped between an elevation of 14,000 and 18,000 feet. 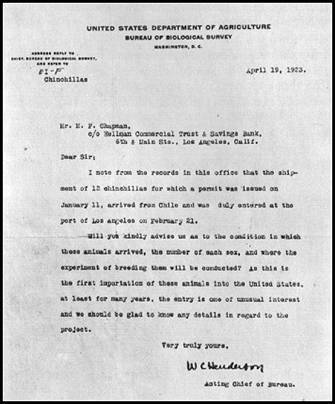 When they arrived in San Pedro on February 22, 1923 (Washington’s birthday), the Chapmans had twleve chinchillas with them. One chinchilla had died during the voyage and two babies were born. 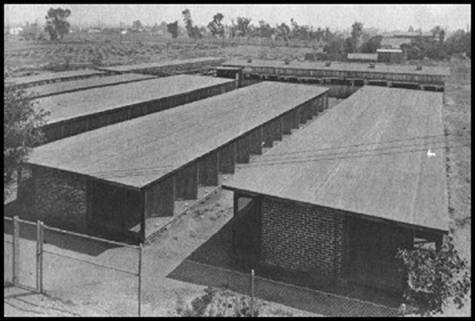 The twelve chinchillas stayed briefly in Los Angeles until the first U.S. chinchilla farm was built in the high desert area of Tehachapi, California. Mr. Chapman endured several problems at first. From the start he had problems with chemical matter in the spring water. It was thought this contamination may have affected the chinchillas' ability to reproduce. Then he had to deal with the theft of nearly half his herd. The thiefs broke the padlocks off the doors of the chinchillas' houses. Some of M. F. Chapman's original eleven chinchillas survived him. One of his animals (the eighth one caught and for that reason tattooed with the number 8), lived to be about 22 years old. His exact age was not possible to establish since he was born in the wild. He was nicknamed Old Hoff, for the German blacksmith who built the shipping cages used to transport Mr. Chapman’s chinchillas to the United States.